Chez Fert welcomes Anglers - Permits and Day Tickets can be arranged for your visit. The South-West of France is covered with Lakes full of fish, here are a couple for you to enjoy a few days fishing while exploring the beautiful countryside, not to mention the glorious weather. You do not have to be a professional angler to enjoy fishing here. You can re-discover those skills from way back when, or learn from scratch, while enjoying the tranquil surroundings. This is a rich natural site protected to preserve its unique culture heritage. There are three large lakes to Fish – Each one has specialist fish stock. Some of which are mentioned below. Permits are available from the site Museum and can be purchased in time for your arrival. 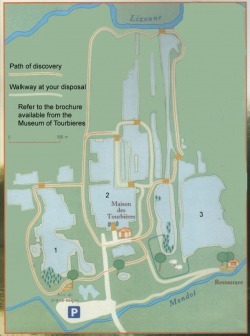 You will also be provided with a plan of the footpaths to guide you to each Lake. Black bass are highly sought-after game fish and bass fishing is an extremely popular sport throughout the bass's native range. These fish are well known as strong fighters, and their meat is eaten, being quite edible and firm, though catch-and-release fishing is becoming more popular in order to preserve fish populations. Common and Mirror Carp are extremely popular with anglers in many parts of France. They can grow to a length of 1.2 metres (3.9 ft) and the oldest recorded age is 38 years. The largest recorded carp, caught by an angler in 2007 at Rainbow lake near Bordeaux, France, weighed 40.1 kilograms - 88.4 lb. AMBROSE SMITH smashed the World carp record with this truly colossal 99 lb monster mirror in 2009, as the global best nears the magic 100 Ib mark. The Buckinghamshire roofer caught the fish known as Scar from Luke Moffats’ fishery Le Graviers in Dijon, France. Then only days later, silencing those who doubted its huge weight, John Bryan, from Essex captured the mega mirror again at… 99 lb. striking lucky within 20 minutes of casting out! Roman Hanke made an amazing catch in June 2012. The monster mirror scaled a mega 46.10 kg - 101 lb 4 oz and was – as is customary across Europe – measured. at 113 cm long. It was caught at night on a birdfood boilie at 11.3-hectare (28-acre) Aqua Lake, a former gravel pit near the truly massive (146,500-acre) Lake Balaton, Hungary. This beautiful, tranquill lake is only 20 mins away. Do not worry about bringing equipment with you. Fishing Tackle can be hired on request. A Day ticket is required for this water, payable at the lake.